So there's a new Pokemon game coming. The next game pair in the Pokemon series and introducing generation 8, Pokemon Shield and Sword will be releasing late 2019. Details are still somewhat scarce as to what we can expect from the game overall. We're still not sure just how many new Pokemon will be introduced with these games or even what the final evolutions of the starters will look like. We just know what your initial choices will be and that the continent/island we're adventuring through is based off of Industrial Age Britain. Beyond that we really don't know much. We don't even properly know how Z-Moves and Mega Evolutions will work or if another similar system will be introduced. Honestly, all I've got for you is memes. In researching for this article I found a truly AMAZING number of memes. The instant reaction the internet had to Shield and Sword's announcement rivalled and eclipsed the one surrounding the announcement of Pokemon Sun and Moon. Going into the Alolan region we had meme's aplenty joking about the Alolan forms of Pokemon. Shield and Sword however have seen these memes take on a slightly different note. The pattern of two new Eeveeloutions holds that this generation should see the little fox get a pair of new forms. What really got people talking however, were the starters and ESPECIALLY the region. Grass Type Grookey is described as a curious and mischievous chimp. Well there were meme's aplenty making jokes about the hidden psychopathic tendencies hidden behind his adorable exterior. From a plethora of images photoshopping weapons into his hands to a few jokes about the green haired Donkey Kong from Super Smash Brothers being his final evolution, Grookey seems to have had the tamest of memes made. 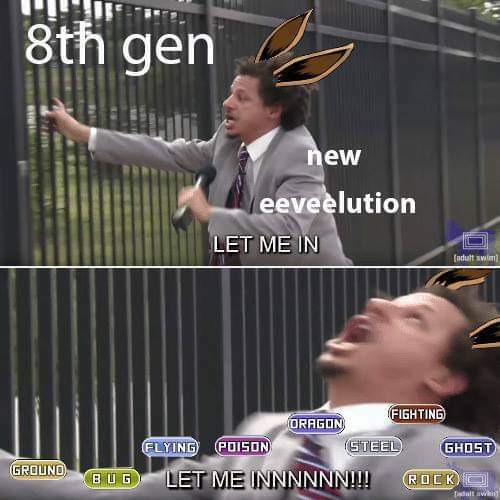 Scorbunny (no relation to the chocolate) is this generation's Fire Type starter. Described as an energetic rabbit who is constantly running around there was nearly instant crossover with Bugs Bunny and especially Big Chungus. People really went to town on these crossovers, mixing just about every well known cartoon rabbit with Scorbunny. The Trix Rabbit, Max from both Sam and Max as well as Max and Ruby and even Roger Rabbit have all had a few bits of blazing orange added to their ears in a kind mockery of the somewhat simple design of the fire bunny. Oh. My. GOD. I have never seen a character become so instantly embraced by the internet as Sobble has. From the moment of the first trailer the nervous tadpole was crowned Pokemon's first Anxiety Type. From the wide downturned mouth and skittish behaviour in the trailer, to its ability to turn invisible, a very, VERY large portion of the Millenial and Gen Z population has embraced him as a sort of mascot for our collective constant worries. 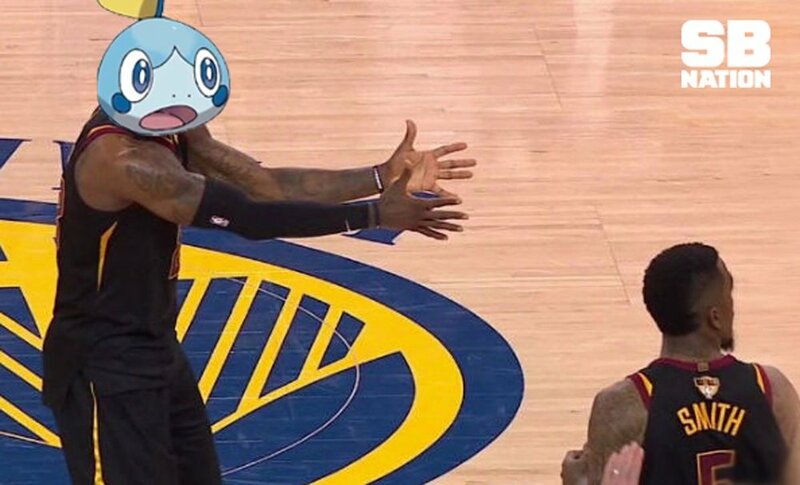 While it really should be concerning that so many people feel represented by a creature who's base characteristic is constant fear about the wider world around it, I just can't get over the insanely fun memes surrounding Sobble. And now, the Galar Region. Essentially the Isle of Great Brittain with a fatter top (make whatever thicc or stacked jokes you deem appropriate ) the Pokemon fanbase has been having a field day with assumptions, hopes and jokes about what we can expect from the NPC's. Sun and Moon did an incredible job of lampshading the entire series and that only further endeared the meme-ers among the fans to keep things going. #Scottishpeopletwitter has been the inspiration of a lovely amount of jokes about what we hope to see when we challenge someone to a Pokemon Fight. If nothing else, Pokemon Shield and Sword has established that the fanbase surrounding the franchise is a better marketing engine than any ad campaign. With just one announcement the meme culture has made weeks worth of content and all of it just continues to keep the name and ideas of Pokemon front and center in the minds of its target audience, and the game designers have taken full advantage of that.